For this round of fall shoe reviews UltraRunning’s Gear Review team coordinated with The Treadmill running store in Carmel, CA. Multiple testers wore each shoe for approximately 100 miles before feedback was submitted. This season’s batch were tested in Coastal California’s rolling trails and steep wilderness areas, as well as throughout the Sierra Nevada Mountains, Colorado Rockies, wet Pacific Northwest forests and technical New England terrain. Our testers range from trail marathoners and recreational trekkers to competitive 100-mile runners and multi-day adventurers. Altra’s Lone Peak has perhaps the most loyal following of any trail shoe we’ve seen among trekking and through-hiking crowds in addition to ultrarunners. In response, Altra now offers this model in four different styles: low or mid heel height and mesh or waterproof variations. We tested the low (traditional) ankle height mesh version for this review and our testing included the steep and rugged Castle Peak 100K course in the Sierra Nevadas. The Lone Peak 4 sees a nearly complete overhaul from outsole to upper; the TrailClaw outsole is more aggressively carved, the skeletal StoneGuard protective plate has improved flexibility, fit through the upper is more snug than previously and the upper has enhanced drainage zones for rapid drying. The stack height remains the same but the overall weight actually decreases slightly. Our testers found all of these changes to be improvements and were impressed with the lightweight feel of the Lone Peak 4 in combination with its strong comfort features and rugged protection elements. The improved outsole shines on steep terrain and the upper breathes and ventilates very effectively. This is an ideal option for long training days, with more than enough durability to take on a technical 100-miler. The PureGrit has been an outstanding all-purpose shoe among trail runners who like a relatively flat and low profile ride, and this year’s version sees significant updates to the upper and outsole. Brooks has gone back to the burrito wrap tongue and offset laces that was temporarily replaced by a traditional system on the PureGrit 6. The midsole platform is largely unchanged, with a flexible forefoot rock plate and a pleasantly cushioned landing for a shoe with relatively low stack heights. Another major change to the PureGrit 7 is the outsole, which shifts from densely packed small lugs to widely spaced larger lugs. The increased spacing helps the outsole shed mud more easily, and allows more flexibility along with longitudinal flex grooves. It’s an excellent hybrid outsole for mixed road and trail use, but struggles to keep grip on loose scree or similarly technical footing. We appreciated the sock-like feel of the upper that accommodates a variety of foot shapes while retaining a secure fit on steep terrain, and the light overall weight of this shoe makes it great for speed training on most trail surfaces. This shoe could convert a lot of HOKA holdouts into true believers. The Torrent was created in conjunction with HOKA’s growing stable of elite racers and is designed to combine light weight, strong cushioning and high agility. It’s the lowest trail shoe HOKA has created to date, but has an aggressive outsole and enough durability to take on tough terrain and long efforts; this was our shoe of choice for the Broken Arrow Skyrace 52K at Squaw Valley this summer. One welcome area of change on the Torrent is the wider and rounded toe box. Many users have traditionally found HOKA’s lasts too narrow, but the Torrent can accommodate almost all foot shapes and allows plenty of room for toe splay on landing. We found the overall fit extremely comfortable from heel to forefoot, and the lightweight mesh upper breathes well and dries easily. The Torrent truly excels from the foot down, with a PROFLY dual density midsole that provides cushioned landing in the rearfoot with firmer and more responsive foam in the forefoot for quick toe off. Beneath the midsole, multi-directional lugs give strong grip in virtually all types of terrain. Lightweight construction is used throughout and our testers loved how the Torrent allows quick leg turnover without fear of taking a beating from the trail. “Workhorse” is the word our team used most often to describe this debut model from New Balance – both for its beefy appearance as well as its rugged durability on every kind of trail. This is one of the heaviest shoes in our test group but it is loaded with comfort and protective elements to give a smooth and secure ride. The strongest feature of the Summit KOM/QOM is the Vibram MegaGrip outsole, which is one of the best compounds available for grip and stability on steep fire roads, wet roots or loose scree. Above it is New Balance’s famous REVlite midsole compound that has great responsiveness, but runs slightly stiff on initial use. A RockStop plate between the outsole and midsole helps further absorb and disperse impact from sharp ground features. The robust protection continues to the upper and front of the shoe, where a thick Toe Protect bumper minimizes impact from unseen rocks or roots in front of you. The uppers of the KOM/QOM are well padded, like a winter glove for your feet. They also run slightly warm due to substantial overlay material, particularly in the midfoot. This is definitely a fall and winter-weather model, and there’s also a GTX version available for those seeking full water resistance. 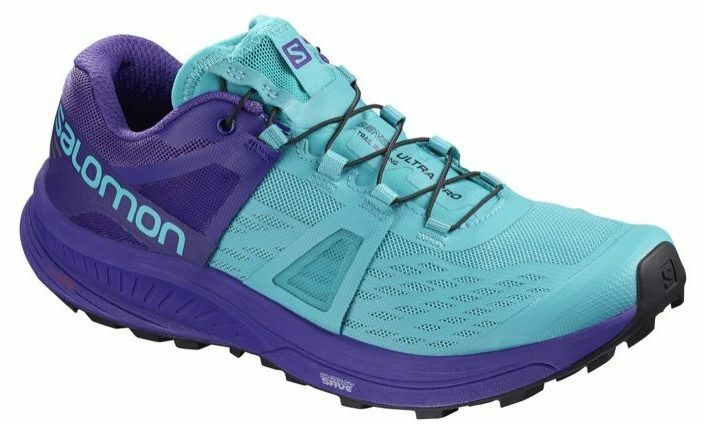 This debut model from Salomon is an offshoot of the high-end S/Lab Sense Ultra, with a lower price point and a more generous fit to attract a larger number of users. Our testers who normally find Salomon shoes too narrow generally had no problem with the Ultra Pro, and describe the upper fit as similar to the Brooks or New Balance models reviewed here. Design and material construction of the Ultra Pro upper is identical to the S/Lab series, including the external “fit wings” anchoring Salomon’s trademark speed lace system to the midsole platform. The Ultra Pro is built with comfort features such as increased padding in the rearfoot area, and very effective breathability through the upper. A resilient TPU EnergySave midsole compound starts stiff but soon provides a pleasant combination of cushion and flexibility. There is no rock plate in this model, and we occasionally felt upward pressure through the midsole on fast downhills – however, the protection was more than enough for one tester to grab a string of Fourteeners in Colorado during Hardrock training. Salomon’s Contragrip outsole gives an impressive hold on wet rocks in river crossings, and the tread lugs are moderately sized to perform well on hard packed dirt as well as loose granite and other moderately technical terrain. Inov-8 made a splash this year with the infusion of graphene into its outsole compound. Graphene is a remarkable material that has been used in sports cars and airplanes to provide thin lightweight strength. In Inov-8’s laboratory testing graphene outsoles have proven to be 50% more durable than traditional rubber outsole compounds. Inov-8 is using graphene in three trail shoes this fall; the TerraUltra G 260 is a unisex model aimed at long distance runners. In addition to enhanced outsole strength, the TerraUltra G 260 has excellent durability in the upper thanks to the use of Kevlar, the bulletproof vest material that has been showing up in some running shoe uppers this year. Kevlar is used in overlays for protection and durability, while the rest of the upper is a lightweight mesh that breathes and dries well. The TerraUltra G 260 has a much wider fit than most Inov-8 models, and the uppers also have a stretch component that can expand if your feet start swelling. Like many Inov-8 models, the TerraUltra G 260 is quite a minimalist shoe in its functional performance. Its overall stack height is the lowest in our test group, and the flexible midsole allows natural biomechanics and enhanced ground feel. The downside of this is unless you’re an experienced minimalist runner, you may fatigue quickly when using these shoes. Our testers found more cushioning and energy return than they expected from a 9mm platform, but also reported that the overall comfort gradually diminishes once you get into double-digit mileage. Interestingly, we also had some issues with grip of the outsole, as the lugs are not particularly deep, and tended to slip in wet conditions or on steep gravel fire roads. We’re looking forward to seeing how Inov-8 combines the graphene material with its thicker and more aggressive outsole patterns in years to come. Topo is gearing up for the launch of several model updates in Spring 2019, so for this fall there are few changes to their existing product line. The MT-2 is a lightweight trainer that combines a moderate midsole platform with natural running biomechanics and a very slight heel-toe drop to help you run more aggressively. 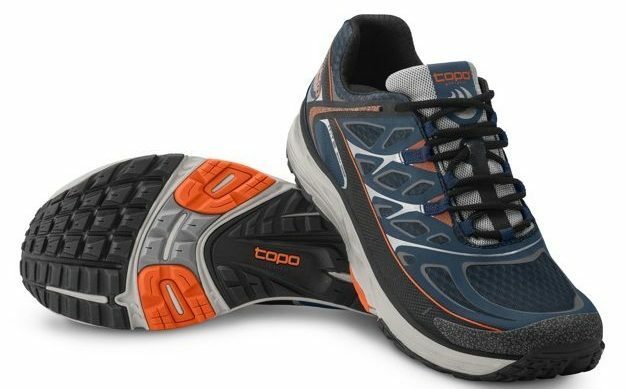 From the outset, Topo’s hallmark feature has been its excellent foot-shaped fit – what our testers describe as the “Cinderella feeling.” On the MT-2, the heel has a soft, flexible counter with an Achilles notch to cradle the rearfoot without friction, while the midfoot is snug and comfortable, and the toe box widens to allow toe splay without excessive movement. Breathability is excellent in the forefoot, but suffers a bit in the midfoot due to excessive overlays. Midsole cushioning on the MT-2 is adequate for experienced minimalist runners to run 50K to 50M, but feels vulnerable in excessively rocky conditions, and on firm surfaces it sacrifices some responsiveness in favor of flexibility. The full-length rubber outsole grips well in wet conditions, but the relatively shallow lugs don’t grip as well as we’d like on steep trails or loose gravel. I hope Altra is also trying to address their abysmal sidewall strength/quality. This weekend I blew through all four sidewalls (L and R of each shoe) on a pair of Superiors… in under 200 miles total. My King MTs blew out under 120 miles. I LOVE the shoes, but the build quality leaves much to be desired, especially at those prices. One runner I know uses them but when we gets them new he plasters all the sidewalls with shoe goo. Perhaps I’ll try that. I hope the same goes for the Hoka Torrent. I’ve had several pairs of Hoka ATR Challengers and have blown out the sides on all of them. I now have a pair of Torrent’s and only have about 20 miles on them – hopefully they hang in there as I’ll be doing a Marathon with them in early November. Ken, I noticed on the previous version (3.5?) of Altra Olympus, there was an additional piece of cloth glued into both sidewalls. I never had blowouts but I know LOTS of people who have. I assume the cloth addition was an attempt to fix that. I have a pair of the newer version of Olympus but didn’t think to look to see what they’d done inside. Outside, it’s clear that on the Olympus, they’ve gone the way of Hoka and added foam up the sides so the stack looks even higher than it is. Just wanted to throw in New Balance Summit Unknown into the mix, quite possibly my new all time favorite trail shoe. Under 9 oz, gnarly tread, and priced under 90 bucks right now make this a winner, been running everything in these, and also make a great winter road shoe as well!